Near the end of the summer of 1961 I traveled to Ohio with my friend from Notre Dame, Marty Meyer. Marty is the first person I ever sailed with. That spring I had just finished the "Learn to sail free" course from Jim Kuras, and we then went to Saint Joseph's Lake to get our first experience in a boat. Marty was assigned to me, and after I rigged the boat, he skippered us out onto the lake where I was to take the tiller for the first time. Just as we cleared the dock, a big puff of wind hit us and caused the boat to heel to port. Marty and I were sitting on the starboard side, me holding the jib sheet and Marty had the mainsheet and tiller. The correct response is to hike (lean) out farther to offset the wind force. So Marty yelled "Get out here!" Fortunately I didn't do the first thing that came to mind, which was that I thought he was telling me to get out of the boat! I almost did, but then, remembering my recent classroom training, I hiked out and began learning how to sail. So in August, after I had been living all summer in Rochelle, working as an engineer for Tilton Homes Company, Marty and I drove to Sandusky, Ohio where we caught a plane to take us to Put-In-Bay. We would be sailing for Notre Dame in their annual regatta. We arrived at the airport before dawn. There was a sign that said we could sleep in our car and they would wake us up when it was time to go. We parked and went to sleep. A few hours later, this old, skinny, unshaven, guy with grease on his shirt knocks on our window and says we can buy our tickets in the now-open office. In the office he is the one who is the ticket seller. After everyone there bought a ticket, he told us where to go wait near the runway. Then he locked the office, got on a little yard lawnmower, drove over to a hanger and pulled an airplane out. 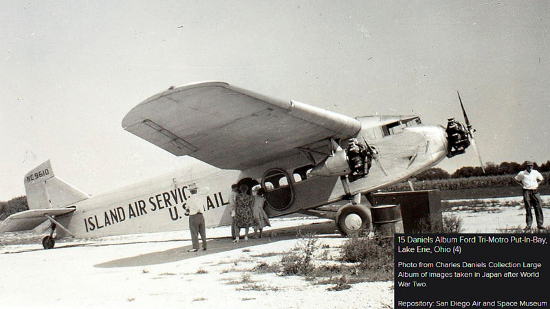 It was a Ford Tri-Motor, one of the most historic planes ever made. And our greasy, ticket-seller/mechanic was also the pilot! I still have my used ticket and a very clear memory of the flight. Inside there were single, wicker seats lined up, one behind the other on both sides. I was sitting next to a little oval window on the right side, and before we took off the pilot came back and looked out my window and the one opposite me. I'm not quite sure what they were, but there were some kind of gauges near the engines just outside the window. We took off in a grassy field and landed in a field on the island that was in about the same shape. After a week of wild parties, trips to a winery, and several boat races, we were exhausted. We barely had enough money to get there, and so we couldn't afford to rent a room. We had to crash wherever we could, sometimes outside, dodging the cops. After spending our money on food and drinks, we barely had enough cash left to buy enough gas to get us back to Elgin. (Those were the days before anyone had a credit card.) To get back to our car on the mainland, Marty and I each sailed an eleven foot Tech-dingy across Lake Erie from Put-In-Bay to Sandusky, where some friends would be waiting to tow the boats back to the Notre Dame boathouse.